Nike has just released images of a new automotive racing-themed high-top silhouette. Standing out with black leather uppers, this sneak has exposed yellow stitching that outlines the lace stays and collar while a bi-colored zip fastening, embellished with repeated “AIR 720” text, runs diagonally across the lateral side. A “RACING” heel piece arrives below the outstretched strap which is buttoned to the side panels. This model incorporates the tallest Air Max unit within Nike’s footwear repertoire, and is further framed by the number of different-sized Swoosh insignia s at the midfoot. 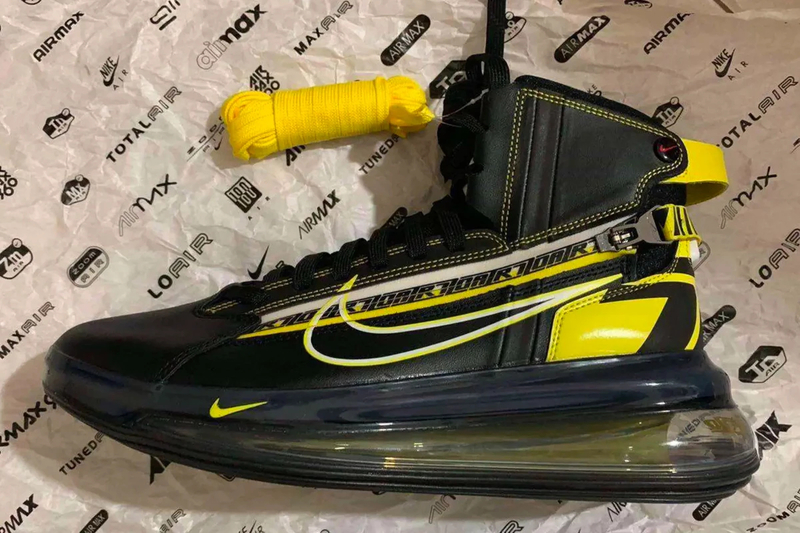 No more information about the high-top Air Max 720 has been shared yet but what do you think?